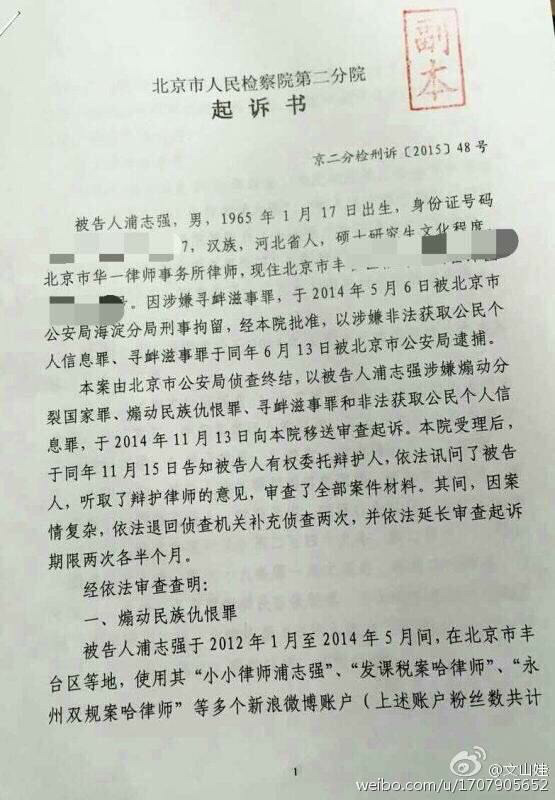 On May 15, 2015, the Second Branch of the Beijing People’s Procuratorate sent the Beijing Number Two Intermediate People’s Court an indictment in accordance with the law against defendant Pu Zhiqiang on charges of suspected inciting ethnic hatred and provoking a serious disturbance. 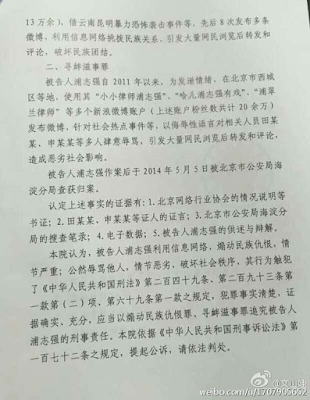 The bill of indictment charges that defendant Pu Zhiqiang used information networks to publish multiple microblog posts over a period of time that incited ethnic hatred with aggravating circumstances and brazenly insulted others with odious circumstances and damage to social order. [On the basis of these acts,] he should be held criminally responsible in accordance with the law. At this point, I would like to say that I believe these charges to be an untenable violation of Pu Zhiqiang’s right to free expression under China’s constitution. 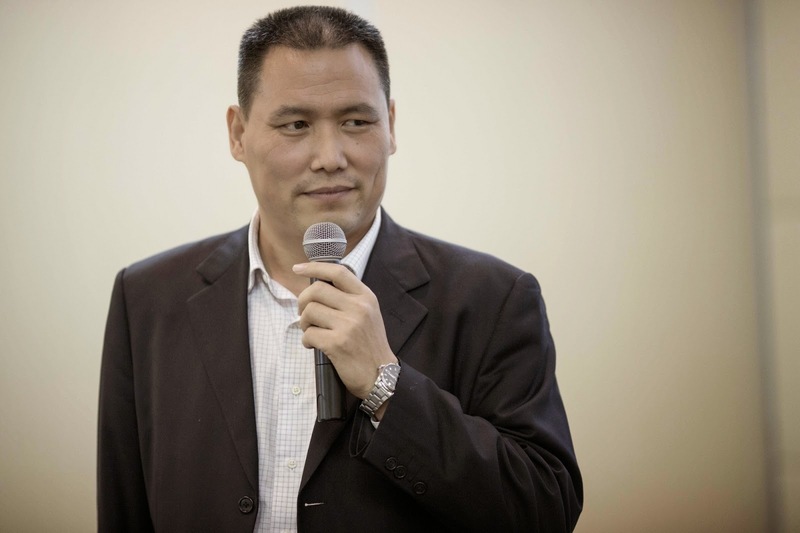 Unfortunately, as Pu Zhiqiang—a tireless advocate for many people charged with speech-related offenses over the years—knows only too well, that argument will have a difficult time winning the day in a Chinese court. Below, I want to address a very specific issue. One of the obvious questions that many have asked is: if Pu is convicted of these two charges, what might his sentence be? There’s been a great deal of confusion on this point, with claims of a possible sentence of up to 20 years. But Shang Baojun, one of Pu Zhiqiang’s defense lawyers, told Verna Yu of the South China Morning Post that his client was facing a maximum of eight years in prison. I believe that Shang Baojun is correct. To explain why, it’s necessary to consider a number of things. Whoever incites ethnic hatred or discrimination, if the circumstances are aggravated (情节严重), shall be sentenced to fixed-term imprisonment of not more than three years, criminal detention, public surveillance or deprivation of political rights; if the circumstances are especially serious (情节特别严重), he shall be sentenced to fixed-term imprisonment of not less than three years but not more than 10 years. In general, one could thus say that the maximum possible sentence for the offense is 10 years’ imprisonment. But does that apply in this case? The summary of the charges given in the indictment makes it pretty clearly that Pu’s alleged offense falls under the category of “aggravated circumstances” not “especially serious” circumstances. I don’t believe that the procuratorate chose that language arbitrarily. So, I think this means that the prosecution is seeking a maximum sentence of three years’ imprisonment for this one charge. (4) Making trouble in a public place, which causes a serious disorder of the public place. Whoever assembles other people to commit the acts as mentioned in the preceding paragraph many times, which seriously disrupt the social order, shall be sentenced to imprisonment of not less than five years but not more than 10 years and may be fined in addition. This last clause was added to the statute in 2011. Prior to that, the maximum sentence under Art. 293 was five years’ imprisonment. Since the 2011 revision, a heavier penalty may be imposed for those who “assemble others” to commit offenses “multiple times.” If these conditions are not met, then the heavier sentencing range is not available. Using information networks to insult or threaten others with odious circumstances and damage to social order shall be convicted of provoking a serious disturbance and penalized in accordance with Criminal Law Article 293(1)(2). The way this interpretation is constructed, it seems unlikely that Pu is being accused of using the Internet to “gather others” to insult people. I believe that if the prosecution wished to make this allegation, it would have been mentioned in its summary of the indictment. Therefore, I see no reason to believe that the prosecution seeks a sentence of more than five years on this charge. Based on this analysis, the maximum possible sentence on these two charges should be eight years’ imprisonment. But even if Pu were to receive the maximum sentence on both charges, his combined sentence would most likely fall somewhere between the heaviest of the two and the total of the two—i.e., between five and eight years in prison. 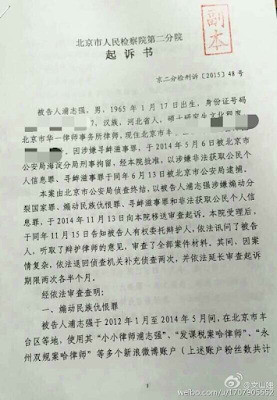 On 2 April 2015, lawyer Cui Hui from Beijing’s Hengqing Law Firm went to the Tongzhou District Court in Beijing, where she was physically assaulted twice by Yang Yu and Lai Xiulin, both of the court’s enforcement division, and a court police officer. The assault left her with minor injuries, including contusions on both eyes, bruises on her face, and multiple soft-tissue injuries on her limbs. Lawyer Cui is understood to have previously reported unlawful behavior by judges in the Tongzhou Court’s enforcement division to the Tongzhou District Procuratorate in connection with a case she was handling. This angered the judges, who found many ways of making things difficult for Cui, including this recent violent assault against her inside the court. 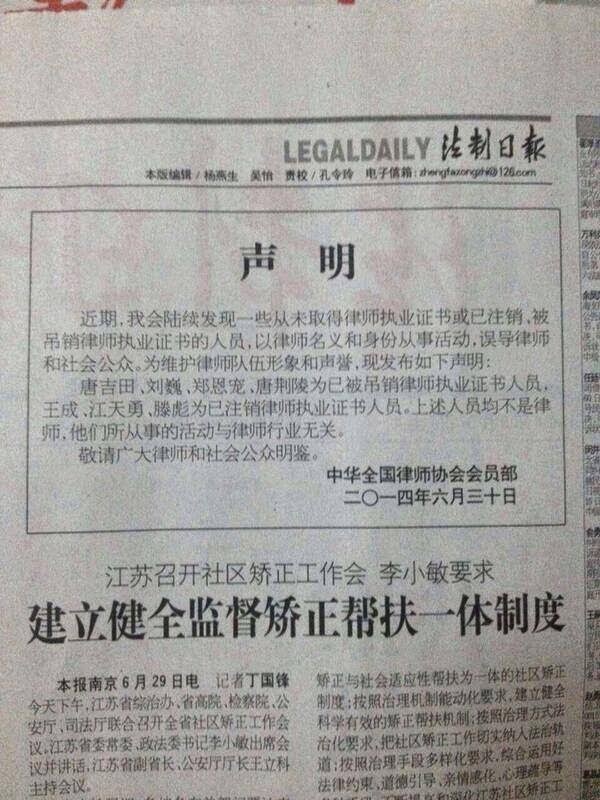 As legal professionals, we are concerned about our colleague, Lawyer Cui Hui, and are extremely shocked and angered by the hideous acts committed by judges and court police at the Tongzhou District Court. 1. The Tongzhou District Precinct of the Beijing PSB should investigate this case thoroughly and launch a criminal investigation for intentional injury against Yang Yu, Lai Xiulin, and the court police officer and strictly punish the perpetrators in accordance with the law. 2. 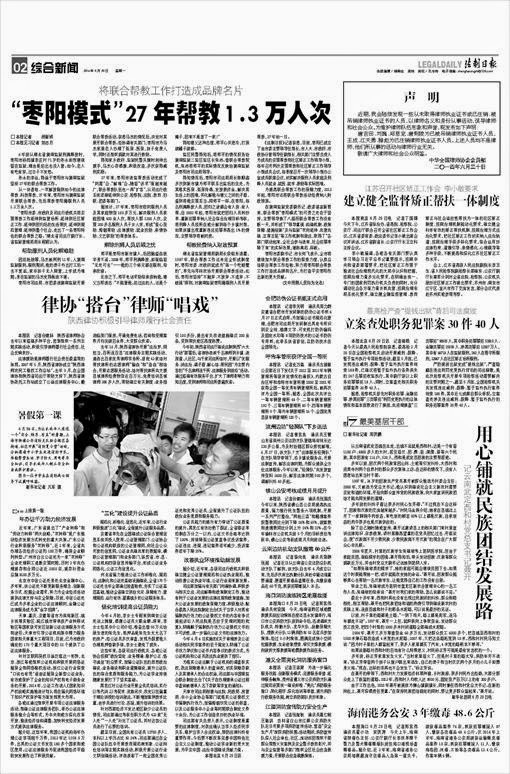 The Tongzhou Procuratorate and Beijing Municipality Procuratorate should investigate Yang Yu and Lai Xiulin for unlawful dereliction of duty and severely punish any such wrongdoing they may discover in order to remove any malignant tumors among the ranks of judges. 3. 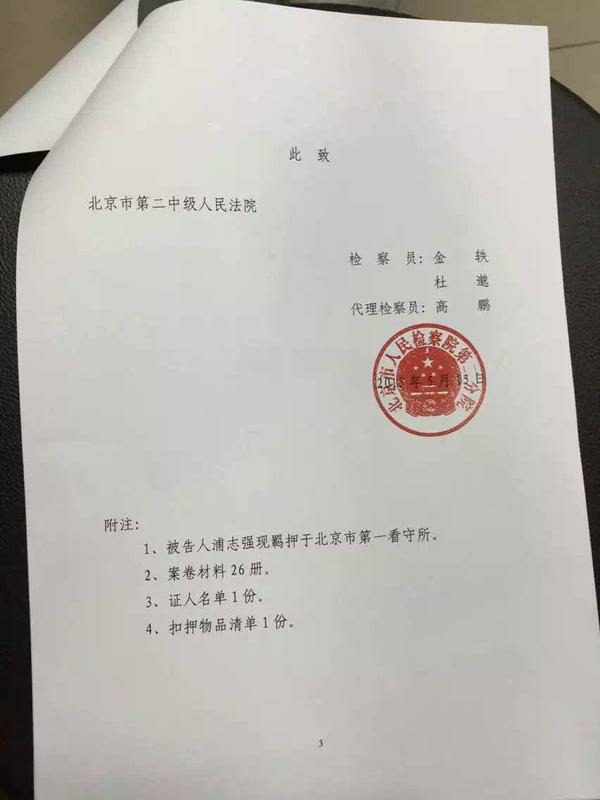 The Tongzhou District People’s Congress Standing Committee should monitor the Tongzhou District Court to ensure that it deals strictly with the court personnel involved in this incident, up to stripping the judges of their adjudication duties. 4. 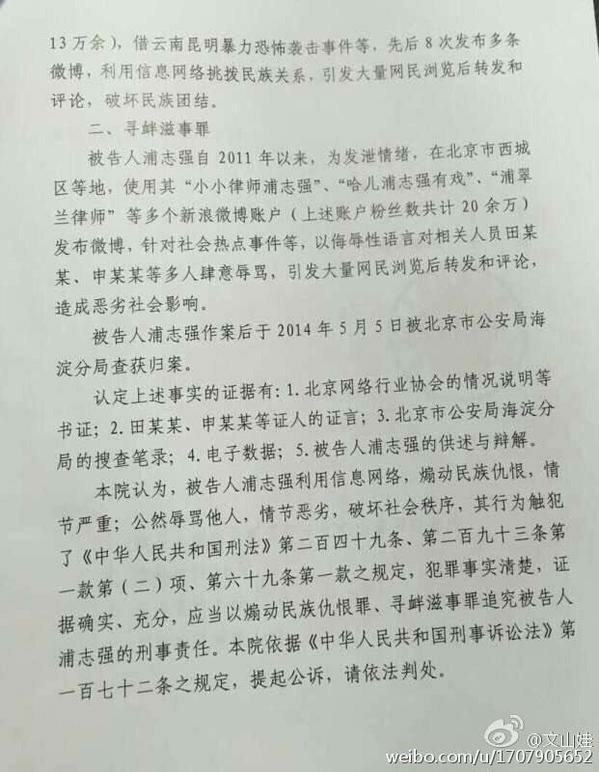 The Tongzhou District Judicial Administration Bureau, the Beijing Municipal Judicial Administration Bureau, the Tongzhou District Lawyers Association, and the All-China Lawyers Association should immediately initiate rights-defense procedures and unite with other lawyers to help Lawyer Cui defend her rights. 5. The Beijing Municipality Women’s Federation and the All-China Women’s Federation should pay attention to Cui Hui’s situation and assist her in defending her rights. The central issue of Hong Kong society’s protest for true universal suffrage in the 2017 chief executive election is their strong argument that citizens should have the right to nominate candidates for the position of chief executive. We believe that this is an inalienable right to which Hong Kong people are reasonably entitled as the masters of Hong Kong and that there is no question that their demands are reasonable. We fully understand, respect, and support the protest demands of our Hong Kong compatriots and urge our brothers and sisters to carry out their struggle for rights in a civilized and rational manner. We firmly oppose and condemn all abuse of official power, violation of human rights, and the use of violence or concealed violence against our compatriots. Hong Kong’s chief executive Leung Chun-ying must take responsibility for misleading the National People’s Congress (NPC) Standing Committee with his political report, and he must conscientiously improve channels of communication and continue to listen patiently and carefully to the forthright admonitions being presented by people from all sectors of Hong Kong society and take effective measures to remedy the problem. The authorities in charge must clearly understand the unique and difficult evolutionary path and options available to Hong Kong and adhere to the the policy of “Hong Kong people governing Hong Kong with a high degree of autonomy,” and follow the tide of international and domestic political civilization. The must push for an NPC Standing Committee decision that truly accords with the sincere wishes of the Hong Kong people, that elates and inspires Chinese in the mainland and around the world, and that will be accepted by the mainstream of international society. We demand that the police immediately release all mainland citizens who have been illegally detained for supporting the reasonable demands of Hong Kong citizens. At this moment in time, we feel more certain than ever of the inseparability of Hong Kong from the mainland and of the importance of civil and political rights to the development of our nation, the revival of our people, and the happiness of each individual. As the ancient saying goes: “The people are the roots of a country; when the roots are firm, the country will be peaceful.” On this point, we also call on the NPC Standing Committee to begin work without delay to enact legislation to safeguard and promote direct elections in the mainland for county and township leaders and people’s congress deputies at the prefectural level and above, in order to better realize citizens’ rights to vote and stand for election, return government to the people, and do everything possible to establish a government that is truly of the people, by the people, and for the people!